The 44th needs you ! Finally, finally, we unlocked the final tier V project unlock on our Federation Dranuur Fleet Colony. To just get here took an insane amount of resources (thanks tbjarnason, Paradoxical, Damix and Akula! ), not to mention time. Of course there are some more sub-projects needed – Cryptic always designed this as a ‘speed bump’ so max fleets would “have something to do”. Yay. And we still do. Most commodities we can buy or collect just playing the game, but the unique Colony ore is, well, unique to the colony. We need a grand total of 306,000. So we’re asking all fleet members to visit the fleet colony and do the mini-game (twice) when you can – it just takes 4 minutes total ! There are various ways to get to the fleet colony: direct flight to the Alpha Quadrant, via your transwarp menu or via one of our other fleet holdings (fleet starbase/transporter pad recommended). When you beam down to the colony, take a right and head east. Just a stone’s throw from the colony main building you see the little ore mining setup. To donate, go to the fleet -or Armada- overview, select 44th Fleet, Holdings and Colony World. The required project is the fourth in the list. Remember it does not matter if your Federation character is in Main Fleet, Delta or Gamma. Our KDFs have their own KDF fleet colony obviously. 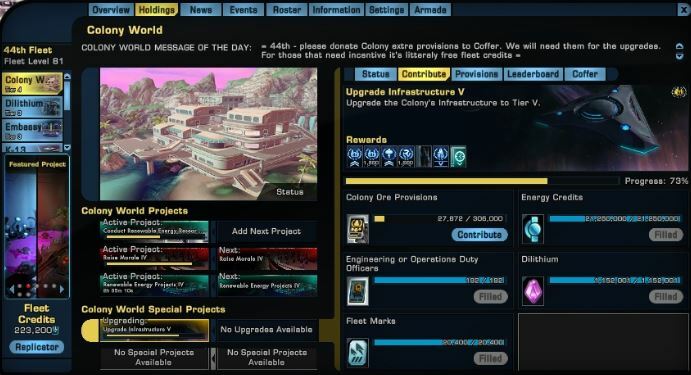 As you can see, donating 250 Colony Ore Provisions earns you 825 Fleet Credits. If you do the Luxury and Battery minigames you can earn a total of 2,475 Fleet credits – it’s the second easiest, fastest and most profitable way way to earn Fleet Credits. The easiest of course being directly donating ec, dilithium or Duty Officers to projects. Remember that you can always donate said ore/luxury/batteries to the Fleet Colony Coffers. This is always available, regardless if a project is slotted or not. 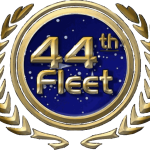 So again, you can earn 2,475 fleet credits a day in 10 minutes or so. And you’ll need them because some fleet ships, fleet gear, other fleet unlocks require over a 100,000 fc’s. Another way is to play the colony world Simulation (20 people ground mission, lasts up to 60 minutes). After wave 30 you get 2100 x 3 provisions which can be donated to fleet for 21k fleet credits. There will be call for participation on daily basis until we complete this project. You can also follow the “Simulation” and “FedSim” channels if sim is starting. 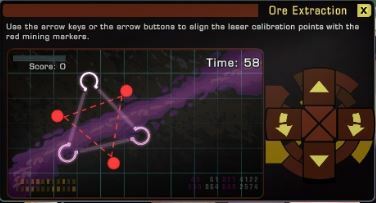 It probably isn’t unlocked at Gamma fleet, but there is alternative location to harvest the ore provision, check the map to find it. Hi Mark. When you land on the Colony world, talk to the mission provider NPC that is straight ahead of you. When you pick up the ore task, the extraction areas will be highlighted on your map. Unfortunately, in Gamma they are not as close as the upgrade platform available in main and delta fleets. Also, feel free to ask in the diplo channel if anyone on can invite you to the main or delta colony world. If one of us are on and headed that way, we’d be glad to do so. You can also grab some goodies and tasks from the upgraded colony stores while there as well. We’re almost there – everyone’s hard work is paying off. By Friday next week we should be lounging around drinking Romulan Ale and being pampered on our shiny new tier V colony. We are now done with that upgrade! My thanks to all who took the time to grind! There are more upgrades to follow, so don’t stop grinding all three provisions. Just doing it once or twice a day can go a long way. I assume the last project will require batteries, the first was ore, current one is luxury goods, I suggest everyone start collecting batteries in preparation, I just stared doing it yesterday on two toons.